Medications can either be dropped off at a participating pharmacy or at a participating law enforcement office. Use our search function to find the closest one to you. Medicines must be from individuals only, not from businesses or healthcare facilities. NOTE: most pharmacies are not allowed to receive controlled substances once dispensed to a patient. If you have controlled substances, drop off medication at your nearest participating law enforcement location. What will a pharmacist accept for disposal? What will a law enforcement accept for disposal? SafeMeds Program includes many local pharmacies and law enforcement agencies accepting your unwanted medications. Disposing of your medicines at a participating disposal location will ensure that they will not be misused and will not enter our environment. SafeMeds is a joint effort between local pharmacies, law enforcement, wastewater treatment facilities and Kent County to provide residents with safe, convenient access to proper medicine disposal. For both solids (pills) and liquids bring medications in their original container. Block out ALL identifying personal information on the prescription label. Do not remove the name of the medication .The pharmacist must be able to see the medication type so he/she can properly sort it. Bring the bottle to the participating pharmacist so he/she can properly sort and dispose of the medication. What cannot be brought to a participating location? Empty bags go in the trash – they are NOT recyclable. If the bag contains a fluid, return the bag to the home care provider, pharmacy or other medical provider. They can dispose of the waste safely and properly. It is not recommended that chemotherapy agents be disposed in the trash or poured down the drain. Contact the dispensing physician and pharmacy to address proper disposal of chemotherapy medications. These medications are highly toxic and designated as dangerous waste. This classification requires the medications to be handled and incinerated differently. Michigan Department of Environmental Quality Rules for Business Waste: Mixed Medical Waste Guidance. As administrator of the program, Kent County staff focus on outreach materials, services to stakeholders, and community action. City of Wyoming staff developed the program in its infancy. Originating as Wy-Meds, the clean water plant personnel pushed for a larger and more developed program. They continue to be a major stakeholder in the program as field staff and in leadership. With us from the beginning, the City of Grand Rapids serves as the primary contact for all pharmacies within the city limits and provides the field staff and resources for medication collection. Making the program possible is our final destruction site. This facility, permitted by Michigan Department of Environmental Quality, is authorized to accept medications for destruction. 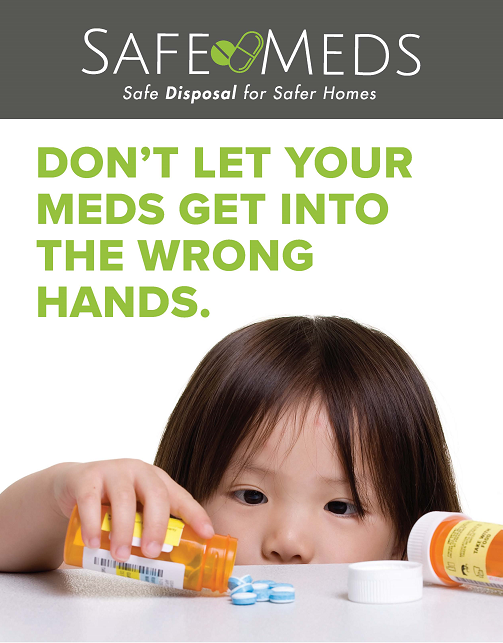 Pharmacies voluntarily participate in the SafeMeds medication collection program because they want to ensure that their customers have safe disposal options for medications they don’t need anymore. They offer convenience through weekend and evening hours. By having direct contact with residents, pharmacies provide an easy disposal solution for many residents who just have non-controlled substances. Participating law enforcement offices provide a one-stop-shop for disposal of medications, both controlled substances and non-controlled. Preventing medications from getting into the wrong hands is a priority for them.